If you are looking for a HD player with powerful function, simple interface and excellent features, well, Any Video Converter Free HD Player would be the top pick. It is an All-in-one media player to play videos, music, online videos and even DVD disc movies free for everyone. Any Video Converter Free HD player is particularly designed for you to enjoy HD movies, video and music on your PC easily. No extra video codec required, smart to play the files you throw to, manage playlist and etc. Multiple skins and different mode for you to dress the free avi player, make it a bit different. Don't hesitate to download the free HD player to have a free try. You would find its superiority rather than other HD players. #2: Convert Spotify music to MP3. Spotify Music Converter is specially designed to convert Spotify music to MP3, AAC or WAV on Mac. With industry-leading DRM decrypting technique, this Spotify audio converter enables maximum 5X speed and 100% lossless quality while converting. - Support all video formats - AVI, MP4, MKV, WMV, VOB, etc. 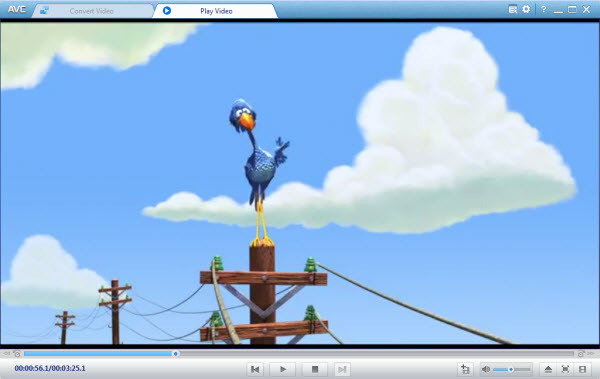 - Zoom video player window into different size according to your needs. - Fast forward or backward the playing video. How to play HD Videos with Any Video Converter Free HD player? This is the user-friendly interface of Any Video Converter Free HD player. Download free HD player from our website, then install this free HD player and launch the program on your computer. * Drag the needed HD files to the application window or onto the icon in the dock. * Click the "Add File" button on the right bottom corner of Any Video Converter Free or click the button in the main window to open the HD file. * Right-click the file in Folder and choose "Open With" option. Then choose Any Video Converter Free as an app which will open the file. Enjoy watching your HD files with Any Video Converter Free HD player - your essential HD player! Note that you can watch not only HD movies, but a great variety of other file types too: AVI, FLV, SWF, RM and RV (Real), MOV, MP4, WMV, DVD, etc. High-definition video or HD video refers to any video system of higher resolution than standard-definition (SD) video, and most commonly involves display resolutions of 1,280×720 pixels (720p) or 1,920×1,080 pixels (1080i/1080p). This article discusses the general concepts of high-definition video, as opposed to its specific applications in television broadcast (HDTV), video recording formats (HDCAM, HDCAM-SR, DVCPRO HD, D5 HD, AVC-Intra, XDCAM HD, HDV, and AVCHD), the Disc and the D-VHS video tape format.